They forgot about God. They forgot about doing what pleases him. They didn't want God to rule over them, and so God sent the Philistines to rule over them instead. 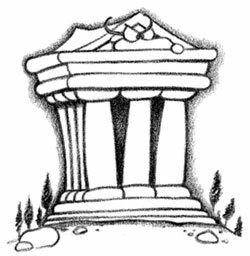 The Philistines made their lives miserable. It wasn't that God didn't love his people. They needed to know what life would be like without him. And then one day, a woman was out working in the fields. She had her back to the hot sun when someone came up and touched her on the shoulder. Maybe it was the bright sunshine, or maybe it was something else entirely, but when she looked up, she saw a man so full of light, he frightened her! "Do not be afraid!" the man said. "I have come with good news. You are going to have a son!" Well, this was BIG news! The woman had never been able to have children. "You must not drink any wine, or strong drink," the man continued, "and when your son is born, you must never cut his hair. He is going to be a Nazirite, a person set apart for God. He is going to save your people from the power of the Philistines." Now, never getting a haircut seems like an odd thing to command, but her son was going to be dedicated to God. You always give your best to God. Back in those days, the people would choose a sheep from their flocks to offer as a gift to God. It was always the best of the flock, without any spots or anything wrong with it at all. It was as perfect as perfect could be. Maybe by never cutting her son's hair, he would be like one of those lambs, as perfect as the day he was born. Well, anyway, this sort of thing - mysterious strangers appearing with news from God - doesn't happen every day, so the woman ran to tell her husband, a man named Manoah. "A man came to me today - and I think he was an angel!" she said. "He didn't tell me his name, or where he was from, but he said we are going to have a son!" Then Manoah prayed, "Please God, send this man back to us to tell us what to do!" The next day, the woman was out in the fields again, sitting in the bright sunshine. She looked up - and there was the man again! She ran to tell her husband. "The man is back!" Manoah ran out to the fields, and there was the man standing there. He WAS frightening to see! "Are you the man who told my wife we are going to have a son?" Manoah asked. "I am," said the man. "What should we do?" Manoah asked. "You must do just as I told her. Your wife must not drink any wine or strong drink, and when your son is born, you must not touch a hair of his head." And then Manoah said, "Please sir, don't go. Let us cook you a young goat for dinner." "You may prepare a goat if you wish, but burn it as an offering to God." "What is your name?" Manoah asked the man. "I cannot tell you. It is a name of wonder!" So Manoah did as the man said, and he burnt a goat as an offering to God, the "God of Wonders." The man stepped into the fire that was rising up from the altar - and went up into heaven in the flames! Manoah and his wife really HAD been talking to an angel! When angels appear in the Bible, sometimes they are angels like we think of angels. They are messengers from God. But sometimes they are God himself! 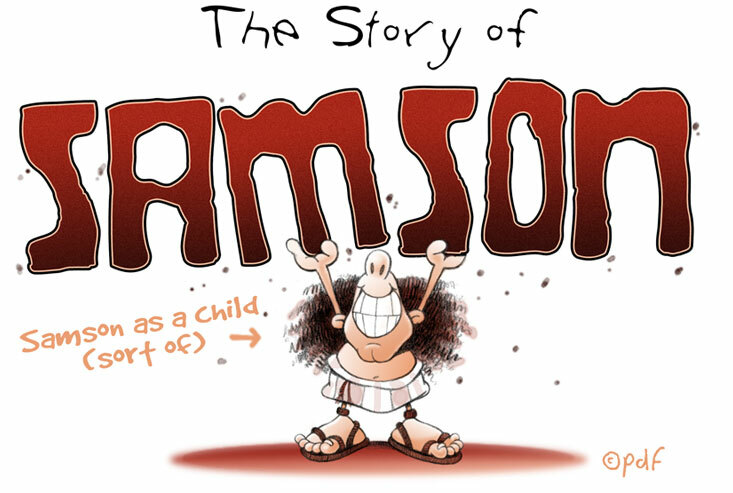 And since Jesus is how God comes to us and makes himself visible to us, it seems the "angel" that came to Samson's parents was most likely Jesus himself!